Chatiw is a chatting site that offers interesting advice. It’s a free, anonymous and no needed registration! Its main focus seems to be dating, people can find singles in their area, as there is a button that can search and mark your location, so that you are paired with those who live nearby. You do not need to reveal who you are, you don’t need to register a profile, simply typing your preferred nickname is enough. Any discussion group you join can turn into a private conversation to which you can go to if you enjoy talking to a specific user. The chat lets you stay lowkey and reveal only what you want to reveal, you don’t need to show your face or say who you are and you can take it step by step, let the friendship hopefully develop into something more at its own pace and privately. ChatIW offers more features, such as articles about dating, online dating, very detailed and informative texts that can advise you on these complicated and sometimes stressful issues. You can learn about netiquette, find out how to talk to strangers to get a date, how to begin conversations with new people online or all the things that you should avoid doing when online. This chat gives you a lot of freedom in doing what you want to do, but it might quickly ban you for certain behaviors, so watch out. You should remember that people have different expectations and preferences, so be respectful and that gives you a higher chance of having people interested in talking to you. It’s guaranteed that you will find someone who matches your needs and wants. The nickname can and probably should be a bit flirty, as one of the chat’s articles advises. Stick to general requirements, stay polite and be relaxed too. Use their advice articles if you are feeling nervous. The conversations are private and this form of contact is the most effective chatting experience that you can have! There is always a lot of people online who are available and active anytime during the day or night. The chat is available in different languages, but most of its users are from the United States. Some extended features are only available for VIP users. Their app, available on Google Play, might be a quicker option for you as it displays the stuff that is necessary. It’s a fun site that may mostly help you find casual talks with strangers and a lot of fun, so choose it if you are after those! ChatIW is a chat that requires no registration and is completely free, being open to anyone who wants to join and asking them no questions. It’s simple and quick to start chatting. 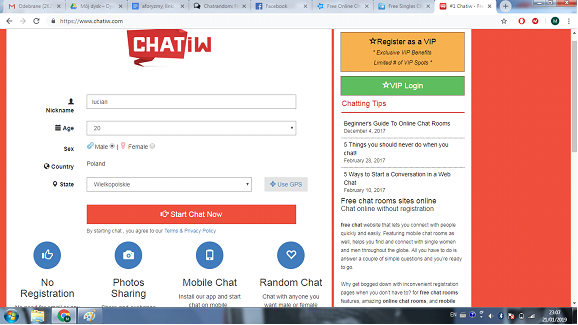 If you are looking for a place online that won’t ask for your details, will let you chat freely and set your preference, someplace that’s text-based with additional features, then ChatIW.com is definitely a chat for you! Your nickname could be your defining feature, something funny or a simple fact about you, but it can be a great beginning of the conversation! You can share pictures with fellow users and stay in touch outside of the chat. ChatIW may be perfect for you if you are looking for anonymity and fun online. You can hide your identity under a nickname and begin chatting. ChatIW wants you to have fun and enjoy your time on their site. You are free to flirt and learn how to be comfortable around people who are looking for more or less casual relationships or simply conversations with strangers and the thrill of meeting new people and being flirted with. If everything is going well for you, soon you can exchange more details and stay in touch, maybe talk on video more and more frequently, eventually hopefully having a chance to speak face to face! ChatIW is one of chatroulette alternatives that makes chatting easy and gives you the opportunity to chat with strangers instantly. You can message new people and get to know them online. There are plenty of ways to chat with new people - you can send texts, share pictures with them, pick your nickname and you are in within minutes or less! If you stumble on someone you find cute, handsome or someone who gets you excited, do not waste time. Use this advice to talk to strangers on ChatIW, one of popular sites like omegle. Do not say obnoxious stuff that the other person might not appreciate. You might not know what the other user’s preferences or orientation are, so do not be explicit in your words. Compliments are okay, but begin by trying to get to know them as people. If they find you attractive as well, you will probably be able to bring this new friendship to a new level. If you both are compatible in terms of what you want and what you are looking for in life, pursue it and each other. Share photos of yourself, share your social media accounts, by then they should know that you like them and appreciate not only their personality, but their appearance too. Do not get nervous and remember to believe in yourself. Chatting on chatroulette sites might seem like it can get you stressed, but be brave, you surely have a lot of beauty in yourself as well, just let the other user see it. Do not put yourself down and expect them to deny your self-deprecating comments - confidence is key! Chatroulette alternatives like ChatIW do help their users get to know people who believe in different things and want a lot in life. Believe in yourself. Smile, listen to them and show you are interested. Without this, your new friend will have no idea that you like them. It’s possible that you will meet someone that you immediately click with. That’s when you will know what to do to keep that person in your life. Chatting with strangers online can be very good for the social life you have. Text the person and they will message you back. If you get along, keep it going. Make your time online is spent with people you can relate to. 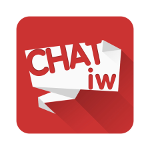 ChatIW is extra popular, a very useful chat room site for connecting strangers!